I just wanted to share a few of our Halloween decorations. 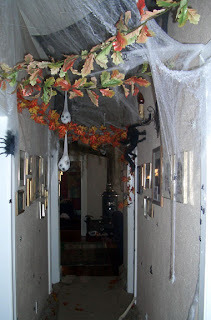 We made a scary, spider infested hallway. We hung fake leaves, Spanish moss, and webs from the ceiling. On the floor, we brought the forest indoors by making a runner out of burlap, Spanish moss and leaves, as well as loads of fake spiders and bugs. 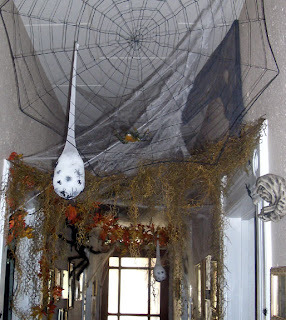 Using Martha's inspiration, we made "spider egg sacs" out of white nylons, fiberfill and plastic spiders. Clear thread suspends three egg sacks as well as spiders from the ceiling. The overall effect was creepy. 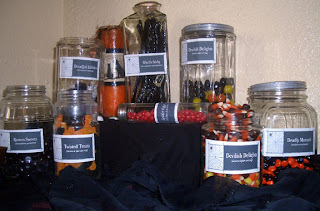 Also from Martha, I made Apothecary style candy jars. 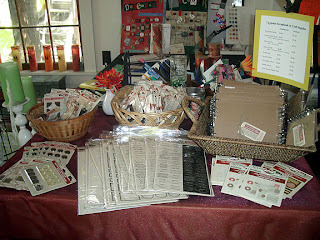 The labels were easy, downloadable and printable from her site. Finding black candy that wasn't licorice flavored was the hard part. (I can't stand licorice!--I couldn't stick to all black. I did find a mix of Halloween colors, though). 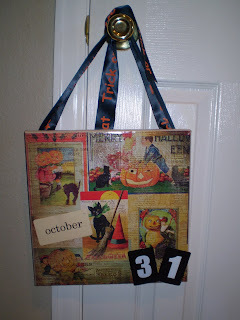 And from Somerset Home, Kerry and I each made a magnetic calendar to countdown to Halloween. Sort of an advent calendar idea. 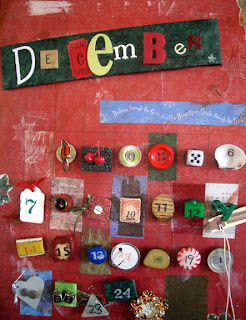 It was fun to find all the different images and items to use for the numbers and details on the calendar. The back is sheet metal covered with tissue and sealed. Each number and the month are magnet backed. The kids have enjoyed putting up a piece on each date. We have a November topper, too, so the fun won't stop tomorrow. Oh -- I feel like I have been absent. I have been an absent blogger, certainly. But, today, I return! As Kerry told you in the last post, we both strive to live artful lives. What is an artful life? There are so many aspects I can think of; hanging fabulous, original art on the walls of your home; wearing unique clothing items; carrying a fun purse or tote bag; making art (for art's sake); owning a pair of crazy shoes (and wearing them); making and sharing beautiful food; choosing or making home accessories that reflect a sense of artful style. I am sure there are many more ways to let art filter into everyday life. Taking pictures around my house, to look for the sense of artful life, I found myself in the bathroom. What, the bathroom?!? you may ask. Yes, even a bathroom can reflect a sense of art and style. I have used my guest bathroom as a display for various black & white objects and pictures that I already owned. It is amazing what an impact things can have when grouped together. 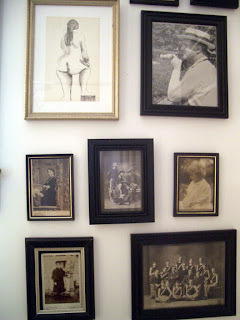 I framed a number of old black & white photos and art pieces in black frames and hung them together. Some of the photos are family shots, some of them are vintage finds. The sketch is one my great uncle did. I love the overall effect. I looked for a tissue box that would complement the vintage theme. I had no success. Why buy one, when I could make one? Using a wooden tissue box from Michael's Craft store, and vintage images from Dover Publishing, Somerset, and others, I created this box. I love it! It really completes the look I was trying to achieve. The candle is one I made, also. 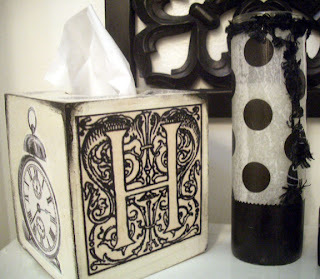 I used black and white tissue paper on a tall white, prefilled candle. I, too, will continue to look for ways to let art be a focus in my life. As I find those ways, I will share those worthy of photos. In what ways to you live an artful life? Let us know how you express your creativity. I have been trying to take a cue from Somerset Life magazine and live a more artful life. It is a challenge but still a lot of fun. So, this month I created a new piece of Halloween decor for the house. 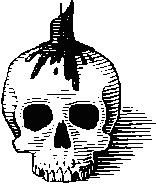 Rachel and I found this great Halloween paper and I loved it so much, I couldn't even cut it to use for collage. So, I used it whole and added vintage flash card words and metal numbers from 7 gypsies. The finishing touch was this great 'Trick or Treat' ribbon that was tied on a gift my mom sent me a few years ago. So, easy and I get loads of compliments on it. So I will keep moving ahead with my challenge and try to infuse art in every aspect of my life. 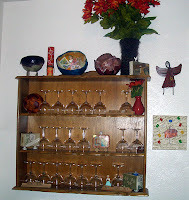 It makes me feel good when I surround myself beautiful and original items. There are always more places to incorporate art into my surroundings. I just need to continue to be aware and continue to work on it. 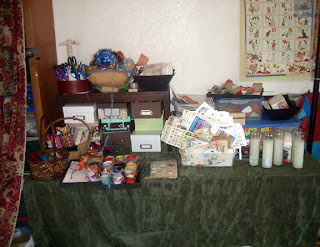 In case you can't make it to the sale, I thought I would share some photos with you. Everything looks fabulous! We are open tomorrow, too. 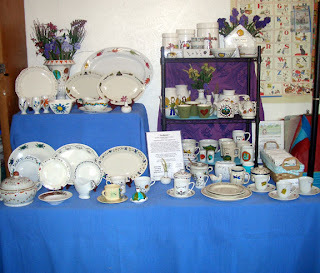 Pop in from 9am - 1pm if you'd like to take a look for yourself. This Friday, October 19 and Saturday, October 20, we have invited 4 artists to join us for our fall art and fine craft sale. Today I would like you to meet Linda Brookover. Ok, Kerry and I have been in serious hummingbird mode this week. 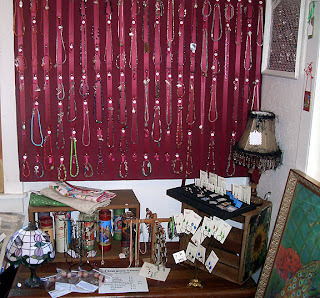 We had crazy-busy orders for jewelry plus we were hard at work getting ready for the sale and publicizing. That part is hard. Does anyone have an easy button for that? Anyway, we are finally all ready and I can stop and take a breath and introduce you our friend Linda who is brave enough to have two businesses, Unique Boutique Handbags and The Light Idea Lamps. 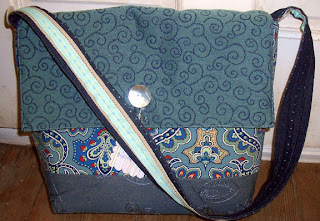 Linda is the maker of high quality fabric handbags and purses. She uses interesting yet durable materials. 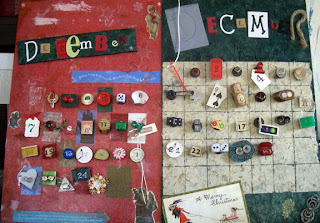 She has an eye for combining fabrics, buttons, and ribbons to make these fantastic creations. Her bags also have lots of detail, with lots of pocket, magnetic snap closures, and even a hook inside to snap onto your keys. Boy, do I need that! I am forever digging in the bottom of my purse to find my keys. 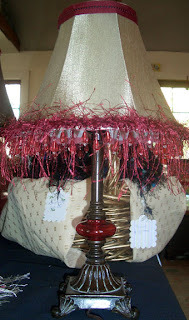 Linda also makes beautiful lampshades! 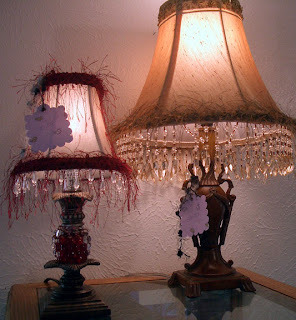 She finds adorable lamps and matches them with the perfect shade which she embellishes with fringe, ribbons, and beads. These creations are quite the focal point in a bedroom or on an end table. Again, her eye for combining texture and color is fantastic. These lamps evoke a sense of softness, femininity, and style. Join us tomorrow at the studio (and Saturday) from 9 - 1 to see We'll even have some nice treats to nibble on, and some warm tea to sip on as you get a head start on your holiday shopping. Can you stand it? All these wonderful women in one place! We hope you can make it to the sale! This Friday, October 19 and Saturday, October 20, we have invited 4 artists to join us for our fall art and fine craft sale. 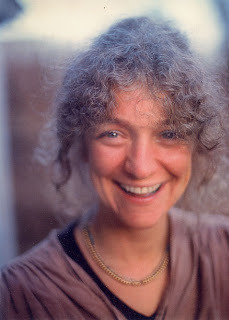 Today I would like you to meet Ruth Meere. 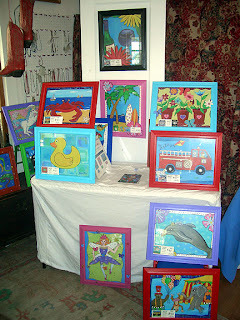 Ruth is the artist behind Fun Lovin' Art. 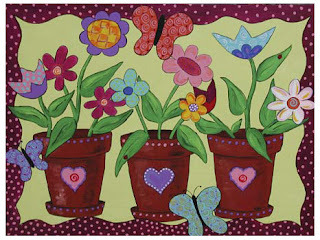 She paints whimsical, fun, bright original pieces. 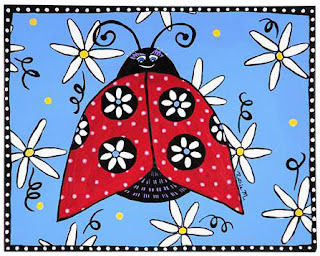 Her subject matter spans the imagination of every child, from mermaids to dragons, lady bugs to lizards, flowers to fish. 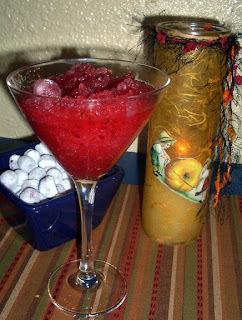 She even has some fantastic pieces for adults, using fruit, martinis, or jazz as their inspiration. The common factor in her work is that it reflects Ruth's bright, exciting personality. She uses vibrant colors and pays careful attention to the details, in the designs of the borders and even in the embellishment the frames on many of her works of art. "In search of personal fulfillment, five years ago I decided to quit my job in Marketing and Public Relations to become a full-time artist. Though I enjoyed my work, I found I always had a hand in the more artsy side of my job. I still do marketing and P.R. 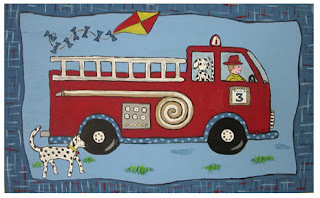 part-time for Crawdaddy's Toys in Lafayette, CO.I paint at every available opportunity - at night and during naptime - thus my housekeeping is very sporadic, but we couldn't be happier, messy house and all." Ruth's approach to making art accessible is what I find appealing. In addition to offering original paintings, she offers mounted prints of her work so that each piece can be more affordable. According to Ruth, a mounted print is a high-quality reproduction of an original painting. 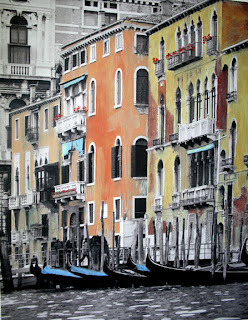 A photograph of the original piece is printed directly onto a 3/8" thick wood board. The board has a finished, beveled edge and requires no framing. It is easy to hang and easy to clean. Most importantly, it looks great! 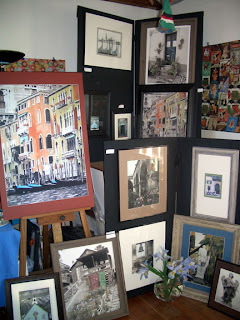 Join us at the studio this Friday and Saturday from 9 - 1 to see Ruth's paintings as well as some other fabulous art! 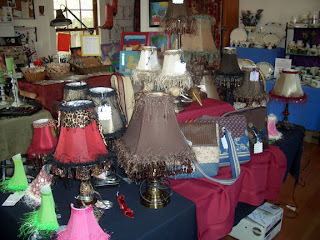 Tomorrow I will introduce you to Linda, maker of fabulous handbags and lamps. Can you stand it? All these wonderful women in one place! We hope you can make it to the sale! 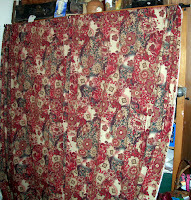 I learned from my blog-friend Rick that today is Blog Action Day. What, I asked myself, is Blog Action Day? After following the links Rick provided, I discovered that today is a day for all bloggers to unite in a discussion about the environment. Whether you are a "tree-hugger" or not; whether, you recycle your soda cans, or not; whether you buy organic, or not; we are all on this earth together. We all co-exist. It is a good idea to reflect on our impact on the world, large and small, around us. The Colorado forests are under attack. The Mountain Pine Beetle has infested much of Rocky Mountain National Park as well many of the forests in the Western United States. These insects attack several varieties of pine trees, notably ponderosa, lodgepole, Scotch and limber pine. This infestation will have a lasting, significant impact on the face of Colorado. These little critters will kill hundreds, upon thousands of trees. In the photo, I took this summer, you can see the number of brown (read "dead") trees out number the healthy, green trees. This, however, is a natural occurrence. What can I do about it? There isn't a lot I can do about this insect nuisance. But we, as people, seem to compound the problem. We cause forest fires. We use de-icers to clear our roads that make the soil uninhabitable. We build and build and build. Perhaps we should be thoughtful in the choices we make. Unfortunately, I have no solution. Only reflection. And a wish that we are all careful with this irreplaceable earth. 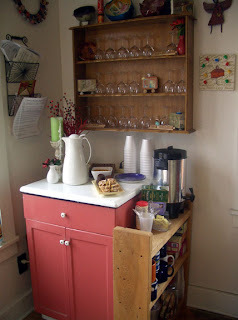 In my small world, I will respond by re-purposing when I can. I will support artists and crafts people who recycle. And I will reflect on what good I see around me. 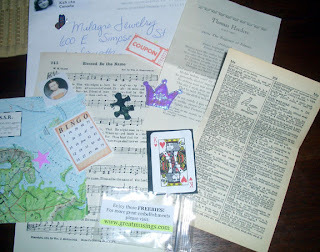 In my part, today, I hope I have joined the cause set forth by the folks at Blog Action Day. To continue the introductions, today I would like you to meet Elizabeth. We were looking for artists to participate in last year's art sale. Elizabeth's sister-in-law, our friend Kathy, introduced us to Elizabeth. Elizabeth had recently moved from California to Colorado; and we were told that she was a great photographer. And is she ever! She takes beautiful black and white photographs of landscape and scenery around the world. Then she adds her own artistic flair when she hand tints those photos. The results are fabulous! Some of the photos have lots of hand-tinted detail, some have minor touches of color, and the works of art created with Elizabeth's careful attention to detail are wonderful. She takes things one step further as she experiments with the presentation, using tasteful matting and framing, and printing some of her creations on canvas for a truly unique look. "My professional background has been in real estate finance though my passion has always been photography and art. 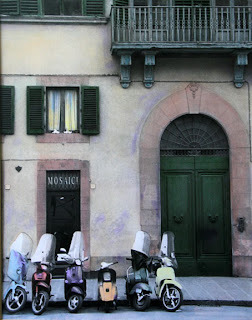 I took a course in hand tinting photographs about 15 years ago which combines photography with painting which was perfect for me. 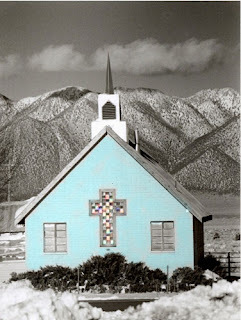 I could actually take a black and white photograph and bring either one particular object in the photograph to life with color or create a unique color scheme to the whole photograph. I now love being a stay at home mom and try to do my artwork during naps and in the evenings. What a wonderful life!!! " 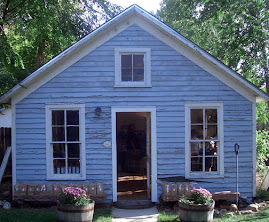 Kerry and I were thrilled last year when Elizabeth agreed to teach a class in our studio. We had several students, including us, who were able to learn Elizabeth's craft. With her gentle, thoughtful instruction, we all thoroughly enjoyed the knowledge and expertise she shared with us. It was a delightful evening. Elizabeth doesn't yet have a website or a gallery showing her work. But her art shouldn't be hidden away! We hope you enjoy the pictures Elizabeth sent me to share with you. Kerry and I are glad that she is joining us for a second year of the Fall Art Sale. We would love to have you come to our sale to enjoy her work in person. And if you know any galleries looking for work this beautiful, I will pass along the information. Next Friday, October 19 and Saturday, October 20, we have invited 4 artists to join us for our fall art and fine craft sale. I would like to take the opportunity to introduce you to each of the artists who will be joining us. Today, you will meet Sandy. Sandy has a gentle soul, and a big heart. She is new to selling and marketing her art; it is a challenging and vulnerable position for anyone to be in. 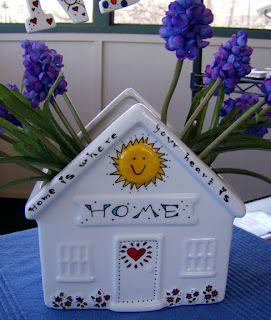 We think that Sandy's art is special because she takes regular items and turns them into magical, whimsical creations. When looking at her pieces, it's hard to even imagine that they had a "life" before she got her hands on them. She says this about her work: "My work takes on many forms from pottery, painted tiles and "found" objects to greeting/post cards, prints, magnets, pins, containers, tote bags, clothing, et cetera. 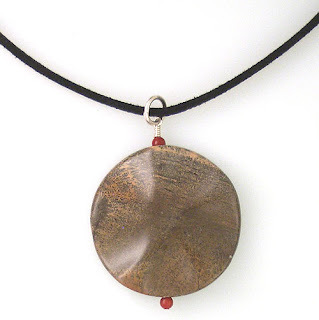 A large part of my inspiration comes from a desire to honor the Earth and all living Beings. I RECYCLE gently used items so that they will be REUSED, thereby RENEWING each item so that it is REBORN. Each piece has a chance to return to life rather than taking up dead space on our planet. 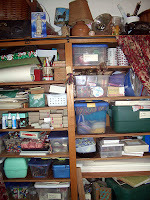 Inventory is constantly changing as I "find" new treasures to paint/rebirth. This process also supports local agencies, charities, those-in-need as I purchase most of my items at places like the Habitat for Humanity Thrift Store, Greenwood Wildlife Thrift, Ares, Salvation Army, Savers and many, many more. Most of my work involves recycled parts, some does not. My images range from the comical to the spiritual. " Sandy redefines "recycling" and uses it as a creative outlet. Her pieces are special, she gives new life to carefully chosen pieces with her magical painting. She takes re-purposing to a whole new level. We are glad that she will be joining us for the sale. And, we are happy to be able to share her work with you. 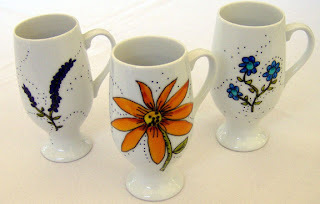 You can read more about Sandy and see her work on her website. 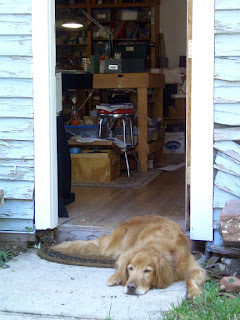 You can come to our studio on October 19 and 20 and see her work in person. What more could you want, a unique piece of art that is eco-minded as well?